President Vladimir Putin said Russia won’t expel any U.S. diplomats in response to Washington’s earlier expulsion of 35 Russians and imposition of U.S. sanctions over alleged cyberattacks during the 2016 presidential election. MOSCOW—President Vladimir Putin said Russia wouldn’t expel U.S. diplomats in response to new U.S. sanctions despite the recommendation of his foreign minister, a move that seemed aimed at embarrassing the Obama Administration while expressing hope for stronger U.S. relations once President-elect Donald Trump takes office. Mr. Putin’s decision came after Russia’s top diplomat, Sergei Lavrov, said in a nationally televised address that Russia must respond to the U.S. moves, which included kicking out 35 Russians it alleged were intelligence operatives serving under diplomatic cover. Instead Mr. Putin chose not to act, and invited the children of U.S. envoys to a New Year’s celebration held at a concert hall on the grounds of the Kremlin. The Russian leader’s move appeared choreographed to highlight an attempt at rebuilding ties with the U.S. that have been at their worst since the end of the Cold War, strained by allegations of Russian hacking and aggression in Ukraine. But Mr. Putin reserved the right to respond in the future. Mr. Putin on Friday slammed the new U.S. measures, which included imposing new sanctions on Russian agencies and companies, saying that they were aimed at further undermining U.S.-Russian relations. “We will formulate further steps in restoring Russian-American relations according to the policy that the administration of President D. Trump conducts,” Mr. Putin said. Both Democrats and Republicans have been warning Mr. Trump that Mr. Putin is no friend of the U.S. and have signaled that they may step in to tighten sanctions on Russia if the Trump administration insists on taking a conciliatory approach to Mr. Putin. House Speaker Paul Ryan (R., Wis.) has also said that Russia doesn’t share America’s interests. While he welcomed the Obama administration’s decision to impose the new sanctions, he hasn’t said whether he thinks additional sanctions or other steps are warranted. The clearest picture of congressional sentiment will emerge next week, when Senate Armed Services Committee Chairman John McCain (R., Ariz.) plans to hold a hearing on foreign cyber threats to the U.S. Mr. McCain has said that Russia and the hacking of the Democratic National Committee will be part of the focus. Among those scheduled to testify are Director of National Intelligence James Clapper and Adm. Michael Rogers, the director of the National Security Agency. The Kremlin’s decision Friday contrasts sharply with Russia’s previous treatment of U.S. diplomats in Russia. The State Department earlier this year expelled two Russian officials, citing Russian mistreatment of U.S. diplomats. U.S. diplomats have long complained of harassment and intrusive surveillance in Russia. Americans serving on government business in Russia are briefed on the dangers of being put in compromising situations by Russian intelligence. Earlier this year, Russian national television broadcast footage appearing to show a Russian police officer tackling a U.S. official outside the U.S. Embassy in Moscow. The Russian foreign ministry claimed he was a spy. Footage showed the Russian pinning the person, described as a U.S. diplomat, to the ground. He is then seen sliding across the ground in an attempt to get inside the embassy. Michael McFaul, the former U.S. ambassador to Moscow, was a frequent target of state television camera crews who stalked the diplomat and cast him in an unflattering light, tailing him and confronting him with hostile questions. He said Friday that Mr. Putin’s move appeared aimed at swaying Mr. Trump. “He thinks he will have the ability with Trump to pursue important objectives defined by Putin, and why mess that up?” he said. “For Putin the objectives are pretty clear: the lifting of U.S. economic sanctions, getting Trump to agree with what he’s doing in Syria and his dream of dreams—the recognition of Crimea,” he added, referring to the peninsula that Russia annexed from Ukraine in 2014. The Obama administration imposed new sanctions on Russian intelligence agencies and expelled what the State Department said were 35 intelligence operatives allegedly serving under diplomatic cover in the U.S. over Russia’s alleged use of cyberattacks to interfere with the presidential election. Russia has denied involvement, and Mr. Lavrov on Friday accused the U.S. of having no evidence. Mr. Putin said the expelled Russian diplomats will spend the New Year holiday at home with family. “We will not create problems for American diplomats. We will not send any home,” he said. The moves by Mr. Obama and Mr. Putin show how both leaders are trying to shape future U.S.-Russia relations before Mr. Trump takes office, said Dmitri Trenin, director of the Carnegie Moscow Center. Most of the 35 suspected intelligence operatives heading back to Russia on Saturday will be from Russia’s Washington embassy, with about a dozen departing from San Francisco, according to a statement on Facebook from the Russian consulate in San Francisco. The Obama administration gave the Russians 72 hours to leave the country. “No tickets left for shorter and more comfortable itineraries,” the Facebook​ post said. The State Department also notified Moscow that, as of noon on Friday, it would be denied access to two Russian government-owned compounds in the U.S. In return, Mr. Lavrov had said Americans should be banned from using their vacation home near Moscow. Mr. Putin said diplomats could use “leisure sites” over the holidays, without specifying which locations he was referring to. “The outgoing American administration of Barack Obama, who have accused Russia of all mortal sins and tried to blame us for the failure of its foreign policy initiatives, among other things, has groundlessly made additional accusations that Russia interfered in the U.S. election campaign at the state level,” he said. U.S. intelligence agencies say Russia hacked the Democratic National Committee and the email account of former presidential candidate Hillary Clinton’s campaign chairman, John Podesta. Officials said the sanctions imposed Thursday were a response to Russia’s election interference, its meddling in American foreign policy more broadly and its harassment of U.S. diplomats. The U.S. had previously imposed sanctions on Russia over its military interventions in Ukraine. The two countries have also clashed over Russia’s military support for Syrian President Bashar al-Assad. —Siobhan Hughes and Felicia Schwartz contributed to this article. On June 16, 2016, the Indian Point Unit 2 nuclear reactor restarted, despite objections from environmentalists, after a routine planned maintenance shutdown. During the maintenance, inspectors had found a small number of bolts had degraded that fasten plates that direct cooling water. Two bolts had failed entirely. Degradation of these particular bolts was not unexpected; it’s a well-known and well-studied issue that was first identified in European reactors. Indian Point replaced the bolts after finding no additional damage. Jerry Nappi, spokesman for Entergy at Indian Point, says Entergy, which owns the reactors, went beyond replacing the damaged parts to ensure the reactor is operating safely. Anti-nuclear-energy groups had used the planned shutdown and the degraded bolts found during Indian Point’s inspection to petition the Nuclear Regulatory Commission (NRC) to prevent Indian Point from restarting. NRC reviewed their claims, found them lacking, and allowed the restart to move forward. Having failed to halt the restart, environmentalists filed a lawsuit against NRC in the U.S. Court of Appeals for the District of Columbia Circuit. In Friends of the Earth et al. v. U.S. Nuclear Regulatory Commission, the Friends of the Earth (FOE) requested the court issue an emergency order suspending Indian Point’s Unit 2 and Unit 3 operations. The U.S. Department of Justice announced it approved of NRC’s response to initial problems at Indian Point, and on June 23, 2016, the court ruled the NRC determination concerning Indian Point’s safety was sound, thereby denying FOE’s request to have the nuclear plant’s operations suspended. Pakistan continues to strengthen and expand its nuclear capabilities – diversifying weapons, fielding new delivery vehicles and accumulating fissile material. With four fully operational plutonium production reactors in Khushab, we are capable of producing at least 40kgs of weapon-grade plutonium a year. Pakistan’s nuclear security managers are also successfully pursuing expanded uranium enrichment capabilities. According to the most recent estimates, Pakistan has a stockpile of 130-140 nuclear warheads and plans to continue to produce more weapons over the next decade. Ploughshares Fund President Joe Cirincione believes that Pakistan has enough fissile material for about a hundred more. However, there is agreement among nuclear experts that if proliferation continues at its present pace, Pakistan will be the world’s fifth largest nuclear power with an arsenal of 220-250 weapons by 2025. Many have argued that further expansion of our nuclear capabilities depends on the future growth of India’s nuclear weapons programme. In the view of such analysts, Pakistan is seeking to create a full spectrum deterrence to reduce the possibility of a premeditated conventional military attack from India. In February 2016, the National Command Authority (NCA), Pakistan’s highest decision-making body on nuclear and missiles policy issues, pledged to do everything to effectively respond to the threats to national security. Unless our civilian authorities and military generals still believe that national security is all about military security, we are headed in the wrong direction. Given India’s aggressive military posture towards Pakistan, I am not against keeping a strong nuclear deterrent. However, Pakistan’s evident willingness to be locked into a nuclear arms race is ill-considered at best and dangerous at worst. Pakistan has enough weapons to destroy India several times over and we do not need to further expand our nuclear capabilities. Lowering the threshold for nuclear use is an extremely dangerous nuclear posture. Why making such a choice? Pakistan should officially declare a moratorium on the production of fissile material for nuclear weapons. We need to get rid of unnecessary weapons systems and save billions of rupees which can be used on education and health. Kenneth Waltz, a pre-eminent American political scientist, argued that the “credibility of small deterrent forces” is more than enough to deter not just nuclear use but conventional attacks as well. The mere possibility of nuclear retaliation can successfully deter countries from initiating conventional attacks. Another American political scientist and national security expert, Thomas Schelling, analysed deterrence in terms of bargaining theory and argued that “the basic existence of a nuclear weapons capability” should provide sufficient deterrence to conventional conflicts. Deterrent power remains unaffected by the unlimited expansion of nuclear arsenal. The real question then is: why do we need so many nuclear weapons? The provocative cold start doctrine is dead. India’s current leadership is well aware that it cannot carry out a targeted strike inside Pakistani territory without the risk of massive retaliation. Pakistan has a strong nuclear force structure. Developing tactical nuclear weapons capability to counter military threats is not a wise approach. The people of Pakistan have no idea how dangerous this course of action is. Not many Pakistanis wake up thinking about the dangers of nuclear weapons. And why should they? Pakistan has great national pride in its nuclear weapons programme and playing even a small role in the promotion of world peace is not our priority. People are totally unaware of the risk of planetary catastrophe posed by the very existence of these weapons. The whole world is on the edge due to an insane rush towards arms buildup in South Asia but we seem to be unaware of it. During a recent policy debate at University of California, San Diego, a writer was alarmed at witnessing a consensus among many scholars from Ivy League universities regarding the possibility of a nuclear war between Pakistan and India. What are we doing to reduce these concerns? Nothing. Scholars and researchers who generally present Pakistan’s case in international conferences and other seminars are totally unqualified for this job. Their only qualification is their ability to unquestionably accept the narrative of the nuclear establishment. We are facing an overall foreign policy crisis because of our tendency to choose unqualified people for important positions. In a nutshell, Pakistan should take three steps – stop producing more fissile material and officially declare that it will not produce any more nuclear weapons, sign the Comprehensive Test Ban Treat (CTBT) and let the Conference on Disarmament (CD) start negotiations on the Fissile Material Cut-off Treaty, and be more open to constructive criticism and hire only well-qualified scholars who can articulate Pakistan’s stance in a convincing and cogent way. These steps will not only help ensure that Pakistan is emerging as a responsible nuclear state but also make India look bad. Pakistan’s current leadership must take these steps if it wants to promote the integration of the country into the global system. Australia’s Four Mile uranium mine in South Australia, a joint venture between Quasar Resources and Alliance Resources, is playing a part in a global lift in production of the mineral. Global uranium production is expected to increase at a compound annual growth rate of 4.3 per cent, to reach 76,493 tonnes in 2020, research and consulting firm GlobalData revealed. The company’s latest report states that growth in production is needed to meet upcoming demand from new reactors. It outlined that output at Four Mile increased from 750t in 2014 to 990t in 2015. There are 22 new reactors scheduled for completion in 2017, with a total capacity of 22,444 megawatts (MW), according to GlobalData. This includes eight reactors in China with a combined capacity of 8510 MW, two reactors in South Korea with a combined capacity of 2680 MW, two reactors in Russia with a combined capacity of 2199 MW, and four reactors in Japan with a combined capacity of 3598 MW. Global uranium consumption is forecast to increase by five per cent, to reach 88,500t of triuranium octoxide (U₃O₈) in 2017. The major expansions to nuclear capacity are projected to occur in China, India, Russia and South Korea over the next two years to 2018. The United States is forecast to remain the largest producer of nuclear power in the short term, with the recent completion of the 1200 MW Watts Bar Unit 2 reactor in Tennessee. Cliff Smee, GlobalData’s head of research and analysis for mining, said: “Commercial operations at the Cigar Lake project in Canada commenced in 2014, with an annual uranium metal capacity of 6900t. “The project produced 4340t of uranium in 2015, compared with 130t in 2014. Meanwhile, production at the Four Mile project in Australia rose from 750t in 2014 to 990t in 2015. Just 15 minutes drive from the upscale homes and modern shopping centres of southern Iraqi city Karbala, Saif Saad’s streets are lined with houses built with breeze blocks and corrugated iron. One of the poorest neighbourhoods in Karbala, mounds of litter lie in heaps on the side of dusty dirt roads, some smouldering with acrid black smoke. Trucks and lorries, abandoned and rusting, dot the landscape. Thirteen-year-old Obeida rides around Saif Saad on a sky-blue bicycle. On the bike, just a little too big for him, he passes a poultry shop and a tyre yard, where workers sit on seats salvaged from scrapped cars, as he returns home. The house Obeida shares with his mother Raqwa and his four siblings stands apart from other nearby structures, and would be unremarkable were it not for the sign which dominates its front entrance. It shows a serious-looking man holding a mounted automatic rifle. Above him flies the Iraqi national flag and below is depicted the Shia shrine of Imam Hussein and blossoming flowers. ‚The martyred hero Waleed Mohammed Hamed‘, a red Arabic script reads next to the picture. Obeida is the martyr’s son. Waleed suffered catastrophic injuries when, during the battle of Bayji in May 2015, he walked into a house rigged with an Islamic State (Isis) IED. He later died in hospital. He was a volunteer in the Shia Imam Ali Brigade and received no payment other than a one-off sum of 400,000 ID ($330). That is all that is to be said of Waleed Hamed’s death, as far as Raqwa is concerned, other than that he, like the hundreds of other Shia paramilitary fighters killed fighting Isis, died a hero in the eyes of his family and the community. This is the first response of most from Iraq’s southern Shia heartlands when asked about paramilitary fighters killed by Isis. Obeida remembers how his father, a labourer, would give him money to go to school. Otherwise, he says little more about him, apart from than that he is proud he died fighting Isis and defending Iraq. However, snippets of the hardship the family has endured since Hamed was killed is occasionally revealed. By the accounts of his family, Waleed was a deeply devout man, and apart from work his principal interest was in participating religious events regarding Karbala’s holy shrine to Imam Hussein, the Shia faith’s third Imam. He considered a pivotal fatwa called for by Iraq’s Shia religious leader Ayatollah Sistani in June 2014 to fight the Isis principal of faith. „He would say we should protect our families, we should liberate our cities and respond to the fatwa,“ Raqwa says. On the rough concrete wall of the family’s house adorned with decoration, Waleed’s photo hangs next to images of Shia devotion: pictures of Ayatollah Sistani, the religion’s highly revered imams and its holy places. Raqwa has to survive in the leaky house on her own, relying on religious charity to keep going. „Many families have sent money to the brigade to support us,“ she says. „The children go to schools related to the shrine. They get money from the Shia organisations and rely on their charity,“ Raqwa adds. On the walls of a room set aside in the Karbala headquarters of the Shia PMF, the Ali Akbar Brigade, pictures of martyrs stare down at visitors. The scores of killed, looking straight down the lens of the camera, died across Saladin province, Anbar and Nineveh. The battles and their names are written in white lettering on the black plastic posters. The brigade’s base is in the former Ministry of Transport building and the fighting group’s flags fly alongside a fleet of government buses. Inside, base co-ordinator Naif Ahmed explains that in their most recent battles at Tal Afar, where the brigade was fighting to cut Isis supply lines, four men were killed by Isis. He says that Isis has inflicted most casualties through IEDs and suicide attacks, adding that these are the tactics of a fighting force in retreat. Ahmed says martyrs are only to be celebrated, not mourned. If he is killed fighting – he expects to rejoin the battle against Isis in Mosul as he did in Saladin province (he has already arranged to have his son come and replace him) – he would consider it a blessing. An officer in the Iraqi army for two decades, his decision to join the PMU is a deeply religious one. „I could have joined the Iraqi army and earned $2000 per month … but I decided to join the PMU because of its affiliation with my faith. [My faith] is much more important than my family because it is what keeps my family protected and secure,“ he adds. The Ali Akbar Brigade was formed immediately after the fatwa by Ayatollah Sistani and the first aspect of its fighters‘ training is doctrinal. It is directly linked to the shrine in Karbala and it places the city’s religious authority above that of PMF command in Baghdad. Ahmed explains that, if called, to he would go to protect Shia shrines in Syria. Although all of Ali Akbar Brigade’s fighters remain in Iraq, Iraqi fighters have travelled to defend the shrine of Sayyidah Zaynab. Ahmed says he revers Zaynab as he does Hussein. „The only difference is Hussein is here close to us; she is far,“ he explains. The call to arms, for Ahmed, is far more important than the effect the war has had on his family, his absence and his reduced wages. „Right now I have two children in school and they are not doing very well because I am not teaching them,“ he explains. „This is the priority. Even though they are not doing well in school, this is my priority. This much more important than my children’s education,“ he says. Outside the great mosque in Kufa, 80km south of Karbala, the tension between the loss of those killed fighting Isis and the political necessity of their heroism plays out once more. In one of the mosque’s central courtyards two young men are weeping over the coffin of their fallen friend, killed in the Mosul operation. The wooden box is plastered with military adornments. The plastic coverings flash in the sun, yellow with the emblem of the PMF, red, white, green and black for the Iraqi flag and green and black for the Saraya al-Salam Brigade, Muqtada al-Sadr’s paramilitary organisation, the latest iteration of the Mahdi Army which fought the US invasion. President-elect Donald Trump offered a short response to President Barack Obama’s retaliatory measures against Russia. Trump’s insistence that “it’s time to move on” may rankle some in the Senate Select Committee on Intelligence, many of whom contend that Russia deliberately attempted to influence the 2016 U.S. presidential election. Obama announced a series of measures Thursday, which include the removal of 35 Russian operatives currently residing in the U.S. The individuals have 72 hours to leave the country. Obama also announced that Russians would not longer have access to two facilities used for intelligence gathering and as a retreat by Russian operatives and diplomats working in the United States. The Russian Federation maintained ownership of a 45 acre property on Maryland’s Eastern Shore (not far from Washington, D.C.). The retreat near Centreville, Maryland was purchased by the Soviet Union in 1972 and transferred to the Russian Federation in 1995. The property was widely covered as a retreat for Russian diplomats for decades. Obama also shut down another site in New York. Obama also said that there would be summary reports from specific intelligence agencies, set to be released before the end of his presidency. Until recently, calls for nuclear armament were considered extremist in South Korean political discourse. However, public support for nuclear armament is growing in South Korea due to North Korea’s nuclear provocations. In a recent Gallup Korea poll, 58 percent supported nuclear armament. If the U.S. security guarantee is not credible in the minds of South Koreans, and nuclear armament is the only way to defend South Korea’s security from North Korea, a nuclear option will seem even more appealing to the public. Such public sentiment would affect the upcoming presidential election. Presidential candidates could appeal to populist sentiment and promise pursuit of nuclear weapons. At the minimum, they may pledge to acquire the ability to produce nuclear fissile materials (enriched uranium or plutonium) so that South Korea could minimize a future timetable for developing nuclear weapons. This would be a major blow to U.S. nonproliferation policy. As long as the U.S. security guarantee is intact, nuclear proliferation in South Korea is not a rational choice, as the costs and risks seem to far outweigh the benefits. The security risks would be substantial. Should South Korea decide to go nuclear, the United States would withdraw its security guarantee, while South Korea would require several years to acquire a functional nuclear arsenal. Unless Seoul could manage a covert nuclear weapons program, fooling its closest ally and the rest of the world, which seems highly unlikely given rigorous International Atomic Energy Agency (IAEA) inspections over its nuclear facilities, going nuclear would in fact decease South Korea’s security rather than strengthening it. The economic costs of nuclear armament are no less substantial. If South Korea’s fear of abandonment escalates under a Trump administration and the country reveals new nuclear weapons capabilities, the UN Security Council would impose economic sanctions on South Korea, which would damage the country’s highly trade-dependent economy. Electricity production, 40 percent of which derives from nuclear energy, would also be disrupted. South Korea imports a large portion of its nuclear fuel from the United States to operate its 25 nuclear reactors. 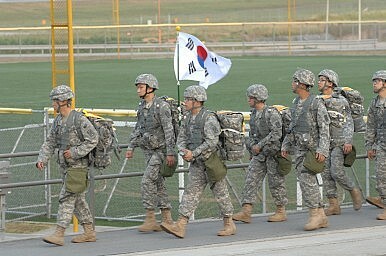 The U.S.-South Korea civil nuclear agreement bans the use of U.S.-origin materials for military purposes. The breach of the agreement would lead to a suspension of U.S. export of nuclear fuels to South Korea. It would be difficult for South Korea to purchase enriched uranium from other suppliers, too, since international nuclear export control regimes, such as the Nuclear Suppliers Group, prohibit transferring nuclear materials to states that develop nuclear weapons in violation of the Nonproliferation Treaty. The suspension of the nuclear fuel supply would cause economic and social distress in this already energy-starved country. Despite the negative consequences to pursuing a nuclear weapons program, the current political environment in South Korea, combined with Trump’s tough campaign rhetoric about the future of the U.S.-South Korea alliance, means that decades-old policies could shift radically overnight. How Trump values America’s security role in East Asia will strongly impact the next South Korean administration’s decision to challenge North Korea with nuclear weapons development of its own. Lami Kim is a research fellow at the Belfer Center for Science and International Affairs, Harvard University and a lecturer at Boston College. What does the „western world“ do in response? Declare the Western Wall „occupied territory.“ This is no accident, since the jihadis believe that they have unleashed holy war against infidels. That war will not end, in their view, until we infidels have been crushed and subjected to the will of a caliph. They’ve got plenty of support from the Russians, without whom thousands of Iranians and Iranian proxies would have been killed in Syria and Iraq, and the Assad regime would have been destroyed. Dr. Michael Ledeen is the Freedom Scholar at the Foundation for Defense of Democracies. He is also a contributing editor at National Review Online. Previously, he served as a consultant to the National Security Council, the State Department, and the Defense Department. He has also served as a special adviser to the Secretary of State. He holds a Ph.D. in modern European history and philosophy from the University of Wisconsin, and has taught at Washington University in St. Louis and the University of Rome. He is author of more than 20 books, the most recent include: Accomplice ot Evil: Iran and the War Against the West; The War Against the Terror Masters; The Iranian Time Bomb; Machiavelli on Modern Leadership: Why Machiavelli’s Iron Rules Are As Timely and Important Today As Five Centuries Ago, Tocqueville on American Character: Why Tocqueville’s Brilliant Exploration of the American Spirit Is As Vital and Important Today As It Was Nearly Two Hundred Years Ago; and, Freedom Betrayed: How America Led a Global Democratic Revolution, Won the Cold War, and Walked Away. Dr. Ledeen regularly appears on Fox News, and on a variety of radio talk shows. He has been on PBS’s NewsHour and CNN’s Larry King Live, among others, and regularly contributes to the Wall Street Journal and to National Review Online. He has a blog on Pajamasmedia.com. Out of the many things that simply scare the bejesus out of people about Donald Trump, the scariest may be his seemingly cavalier attitude about nuclear weapons. Last spring he said he thought more countries should have nukes for their own self-defense. But when he got called out on that remark he backtracked and claimed he had never said it. Last week, in a tweet that seemed to contradict itself, Trump said the U.S. should greatly expand its nuclear arsenal. He’s going to ensure that other countries get the message that he’s not going to sit back and allow that [nuclear proliferation]. And what’s going to happen is they will come to their senses, and we will all be just fine. When MSNBC’s Mika Brzezinski asked the president-elect to clarify what he meant in the tweet, Trump responded „Let it be an arms race. We will outmatch them at every pass.“ Now a North Korean defector says he may be about to get his wish. This is what makes Trump’s position on nuclear weapons so dangerous. If he believes, as Spicer said, that countries will „come to their senses“ over nukes, it’s time for a wakeup call. Many countries, including our own in the near future, are not run by people who are prone to common sense. And Kim is certainly among that group. In October, Director Of National Intelligence James Clapper explained why North Korea’s stance on nuclear weapons is so dangerous. They are under siege and they are very paranoid. So the notion of giving up their nuclear capability, whatever it is, is a nonstarter with them. The best we could probably hope for is some sort of a cap. A cap would require negotiations and a „carrot and stick“ approach to the problem. But Trump has indicated that he has no interest in carrots — he only wants to threaten with a promise to build more and bigger sticks. According to Thae, Kim’s goal is to pressure both the U.S. and South Korea into „stability-focused“ policies by adopting a provocative military posture. That plan may have worked with a normal American president of either party, but we all know Trump isn’t normal. His entire posture is based on dominance rituals in which he must humiliate his opponents. That’s a dangerous type of arrogance to bring to a nuclear standoff. Trump’s proposed arms race will only dig the U.S. into a deeper budget hole than ever. And that’s the „good“ news. If he is expecting leaders such as Kim Jong-un to give in to American demands on nukes in order to avoid an arms race, then the hole we’re talking about might be a smoking, radioactive crater.